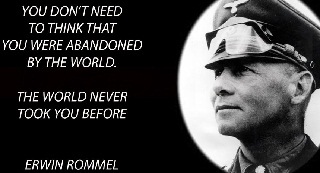 Erwin Johannes Eugen Rommel (15 November 1891 – 14 October 1944), popularly known as the Desert Fox, was a senior German Army officer during World War II. 2. When there&apos;s no clear option, it&apos;s better to do nothing. 3. Mortal danger is an effective antidote for fixed ideas. 4. The art of concentrating strength at one point, forcing a breakthrough, rolling up and securing the flanks on either side and then penetrating like lightning deep into his rear, before the enemy has time to react. 5. In Tunisia the Americans had to pay a stiff price for their experience, but it brought rich dividends. Even at that time, the American generals showed themselves to be very advanced in the tactical handling of their forces, although we had to wait until the Patton Army in France to see the most astonishing achievements in mobile warfare. 6. One cannot permit unique opportunities to slip by for the sake of trifles. 7. I didn’t die nor win. 8. In the absence of orders, go find something and kill it. 9. No plan survives contact with the enemy. 10. The battle is fought and decided by the quartermasters, long before the shooting begins. 12. The German soldier has impressed the world, however, the Italian Bersagliere soldier has impressed the German soldier. 13. Don&apos;t fight a battle if you don&apos;t gain anything by winning. 14. Training errors are recorded on paper. Tactical errors are etched in stone. 15. Men are basically smart or dumb and lazy or ambitious. The dumb and ambitious ones are dangerous and I get rid of them. The dumb and lazy ones I give mundane duties. The smart ambitious ones I put on my staff. The smart and lazy ones I make my commanders. 16. Courage which goes against military expediency is stupidity, or if it is insisted upon by a commander, irresponsibility. 17. Sweat saves blood, blood saves lives, but brains saves both. 18. A risk is a chance you take; if it fails you can recover. A gamble is a chance taken; if it fails, recovery is impossible. 19. 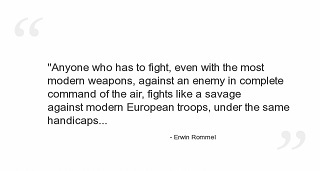 In a man-to-man fight, the winner is he who has one more round in his magazine. 20. Be an example to your men, in your duty and in private life. Never spare yourself, and let the troops see that you don’t in your endurance of fatigue and privation. Always be tactful and well-mannered and teach your subordinates to do the same. Avoid excessive sharpness or harshness of voice, which usually indicates the man who has shortcomings of his own to hide. 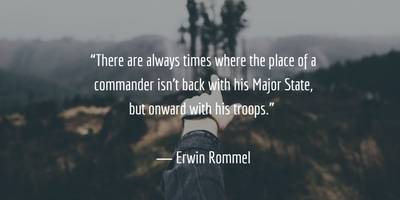 Reading 20 Most Famous Erwin Rommel Quotes And Sayings and feel!